Kybella is the first and only non-surgical treatment approved by the FDA for contouring and improving the appearance of submental fullness. 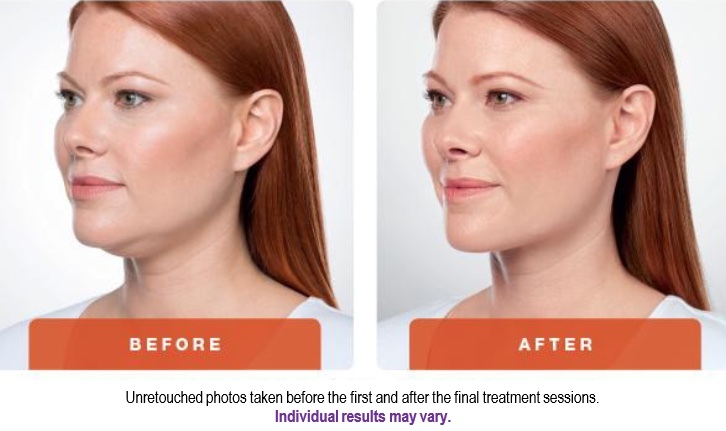 Kybella effectively removes excess fat under the chin, leaving a smooth jawline without the necessary recovery time of other treatments like liposuction or neck lift surgery. Submental fullness under the chin (often referred to as a double chin) is a common issue that bothers nearly 68% of adults in the U.S. according to a survey conducted by the American Society for Dermatologic Surgery. A double chin often disrupts facial symmetry and results in an unwanted older and heavier look. Submental fullness affects men and women of all ages and is caused by a variety of issues including weight gain, genetics, and natural aging. It is not limited to individuals who are overweight. Unfortunately, double chins are often extremely resistant to diet and exercise. Kybella is developed through a synthetic formulation of deoxycholic acid, a naturally occurring molecule in the body that aids in the breakdown and absorption of dietary fat. When injected into targeted fat pockets under the chin, Kybella causes the rapid destruction and absorption of fat cells while also preventing future fat accumulation. After treatment, the fat that is cleared from the area is processed by the body’s natural metabolic process. Kybella only targets fat cells; all other cells and tissue remain unaffected. Kybella is indicated for improvement in the appearance of moderate to severe convexity or fullness associated with submental fat in adults. It is geared toward people looking for an improved chin profile. HOW IS A KYBELLA TREATMENT PERFORMED? Kybella is administered to the fat under the chin through a series of injections. Because each person is unique, a custom treatment plan is tailored for each individual patient. The procedure is non-invasive with minimal downtime or recovery required. Most treatments last between 15 and 20 minutes. Lidocain (a topical numbing anesthetic) can be used to minimize discomfort. Depending on each patient characteristics and goals multiple treatments may be necessary. Most patients experience visible results within two to four treatment sessions. Treatment sessions are spaced about a month apart.